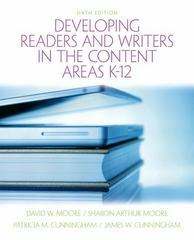 Developing Readers and Writers in Content Areas 6 Edition This practical, engaging text introduces prospective and practicing teachers to K-12 content reading instruction. Unlike any other text in the market, the content progresses from general practices, cycles, and settings of instruction, to units of instruction and specific lesson planning. Well-respected authors Dave Moore, Pat Cunningham, Sharon Moore, Patricia M. Cunningham, and Jim Cunningham speak to educators new to the idea of content area literacy instruction and focus on instruction that is aligned with state standards and tests, yet promote literacy that goes beyond that which is tested. The sixth edition of Developing Readers and Writers in the Content Areas places even more emphasis than in the past on (a) new digital literacies, (b) disciplinary literacies, and (c) English learners and special needs students. Chapters describe instruction appropriate for a comprehensive content-area literacy program (literature, comprehension, vocabulary, writing, study, inquiry, and differentiation), and include end-of-chapter applications that show how the practices apply to specific content areas such as science and mathematics. This text contains accessible language, concrete examples, and adjunct learning aids to help new learners access it.